Home » Health » Reduce inflammation and your waistline with THIS protein-packed breakfast! Avocado improves your digestion because it’s so high in fiber. This fiber helps maintain a healthy digestive tract and reduce your risk of colon cancer. It’s also a natural detoxifier. The fiber in avocado promotes regularity which helps eliminate toxins from your colon. This detoxification helps regulate the immune system and reduce inflammation. Avocado is also great for your heart. The natural plant sterol, beta-sitosterol, helps maintain healthy cholesterol levels which keep your heart happy. Avocados are packed with healthy monounsaturated fats that help to prevent heart disease and certain cancers. Avocados also contain fibre, potassium, vitamin E, folic acid, and magnesium. All of that in one fruit is a great way to keep breakfast simple and healthy. Eggs are also full of nutrients that keep your heart healthy. The vitamin D found in eggs promote bone health, and prevent osteoporosis and rickets. Eggs are full of protein, vitamin A( (which improves vision), vitamin B2 (which helps aid in digestion), vitamin B12 (which helps produce red blood cells), ( and vitamin E (which helps reduce your risk of cancer). They’re filling too, which keeps you fuller longer. 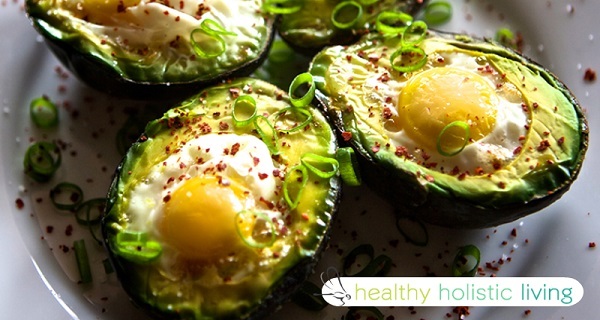 Avocados are full of amazing fats that keep you fuller longer too. Put the two together, and you’ve got a filling, nutritious breakfast.